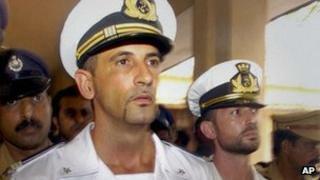 Indian police have charged two Italian marines with the murder of two Indian fishermen. The marines are accused of shooting the two fishermen dead in February after allegedly mistaking them for pirates. Italy has recalled its ambassador for consultations. It says the incident took place in international waters and that the men should be tried in Italy. The marines were guarding an Italian oil tanker off India's south-western coast when the incident occurred. The marines, Massimiliano Latorre and Salvatore Girone - are being held in the central prison in the Keralan state capital, Trivandrum. Italy agreed in April to pay 10m rupees (£117,013; 143,203 euros; $189,000) in compensation to each of the families of the two Indian fishermen. In return, the families agreed to withdraw civil court cases against the marines. However, the diplomatic row between the countries continued despite the compensation and talks between the two governments. Italy said that the Indian fishing boat had behaved aggressively and ignored warning shots from their ship, the oil tanker MV Enrica Lexie. But India said the fishermen, Selestian Valentine and Ajesh Pinky, had been unarmed. The Indian government initially said the event had occurred in its territorial waters and that the marines should therefore be tried under local laws. It recently changed its position, saying that the incident had taken place in international waters and that the Keralan police had had no jurisdiction to detain the ship. However, Keralan state officials maintained the marines would be tried under Indian law.